Welcome back! Ready to learn more about New York’s bustling dining scene? Well, you’ve come to the right place! The Big Apple has many newcomers making a big splash and presenting themselves as a fierce competition to the veterans of the Top 25 list. With that being said, there are a dozen new restaurants that made the November list for 2017. That’s right— 12 new restaurants. Seven of those new restaurants have made it into the coveted top ten spots. Foodable welcomes Ferris celebrating at the No. 1 spot of the list with a score of 188.03. This New American restaurant is located at the Flatiron’s new Made Hotel and it’s kitchen is led by Chef Greg Proechel. The menu features a balance of rustic and refined preparations highlighting Proechel’s favorite ingredients of each season. At No. 2 we have The Aviary’s NYC outpost with a score of 186.99. Debuting in New York for the first time, The Aviary is located at the top floor of the Mandarin Oriental overlooking Central Park. This progressive restaurant/cocktail bar aims to provide an interactive journey for guests, boasting small food plates and inventive, thoughtful cocktails. Needless to say, it’s a unique experience. In third place, we have Le Coucou, another first timer on the Top 25 list, with a score of 186.31. This restaurant is located at the corner of Lafayette and Howard Street and it is led by the Chicago-native and internationally acclaimed chef Daniel Rose of Spring and La Bourse et La Vie in Paris. At Le Coucou, a Stephen Starr restaurant, you will experience chef’s personal take on French cuisine. 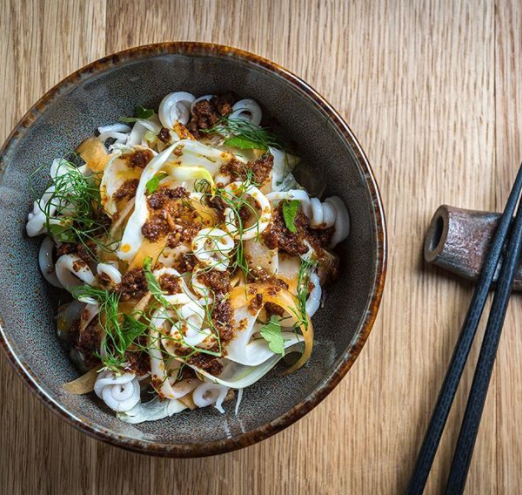 Other newcomers to the Top 25 are: Empellón, located in Madison Avenue, at 186.27; Jeju Noodle Bar, from chef Douglas Kim who’s worked at places like Gordon Ramsay NYC, Nobu and Per Se, at 184.17; Nur, boasting modern Middle Eastern cuisine, at 183.68; Public Kitchen, from the people behind Jean-Georges’ restaurants at 183.64; Fairfax, an all-day neighborhood cafe and wine bar, at 182.02; Emily, from the folks behind Emmy Squared (Watch On Foodable Side Dish Episode, here), at 181.53; THE POOL, a seafood restaurant created by Major Food Group, at 181.49; Alta, featuring mediterranean inspired food, at 180.42; and finally, L’Atelier de Joel Robuchon, a chef who currently holds 31 Michelin stars, at 180.22. For more food destinations, check out the full list below!